If you're a person with ALS or you care for one, we're here to help. We'll connect you with the local resources you need, including equipment loans, grants to help with ALS-related expenses, and access to ALS clinics and clinical trials. Individuals who qualify for the Quality of Life Reimbursement Grant can be reimbursed up to $750 in acceptable expenses. If you would like to apply for the 2019 Quality of Life Reimbursement Grant, applications are taken over the phone or by email. Please call or email Care Services Coordinator, Carleen Hubbel at 614.273.2572 extension 110, or chubbell@alsohio.org. 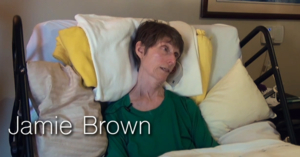 Jamie Brown was blindsided by a diagnosis that turned her world upside down. What she thought was an aggravated shoulder injury was a sign of ALS. Gradually, ALS diminished her ability to enjoy walking, gardening, and water aerobics. In this video, she shares her personal journey with ALS.